Rock this shirt out on the town or at work. Main Color: Gray. Sleeve = 29". Length (collar seam to hem) = 32”. 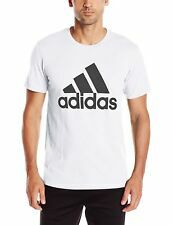 Adidas Men’s Grey T-Shirt Sz. XL NEW. Color: Grey. XL ( pic is of a large). Large trefoil Logo on. Every fibre counts: Organic cotton saves water, conserves energy and reduces the use of chemicals. 100% organic cotton single jersey, Best quality and best price. Regular fit. Authentic adidas Apparel. -Straight Cut. -Short Sleeves. Train in sleek comfort with this long-sleeve T-shirt from adidas. 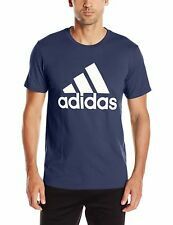 Adidas T-Shirt Blank Navy Blue Tee SZ L.
Adidas Skateboarding Clima 2.0 Ls T-Shirt. Long Sleeve. 30% Polyester. 70% Cotton. Black colorway. White cuffs and collar. White trefoil at chest. Adidas Men’s Grey T-Shirt Sz. Medium NEW. NEW MEN'S ADIDAS ORIGINALS DV3284 SPLIT ADI SHORT SLEEVE TEE BLACK 2XL NWT. Condition is New with tags. Shipped with USPS First Class Package. FREE SHIPPING. TREFOIL TANK TOP. It's made in soft cotton jersey fabric. Contrast Trefoil logo on front. A TANK TOP THAT EMBODIES A CLASSIC ADIDAS ORIGINALS DESIGN. 100% cotton single jersey. Regular fit. •adidas SKATEBOARDING BLACK CLIMA TEE 2.0 TSHIRT. •CLIMA LITE COTTON. •100% AUTHENTIC ALWAYS. Adidas Originals X Neighborhood T Shirt NH SSL V Neck Tokyo Japan Streetwear Large *This item is NEW without tags- size is Large but sized for Japan, runs slightly smaller than US size Large Shipped with USPS First Class Package. Length (shoulder down) 32". Sleeve 9.5". Color: White.